I used the circuit that appears at http://brmlab.cz/project/brain_hacking/tdcs and other tDCS related web sites. I changed the circuit by eliminating the LED indicator light and switch and adding a 3 mA meter and variable resistor. I found that a fixed 150 Ohm resistor in series with a 5 k Ohm potentiometer seems to work best. CAUTION: There is concern on the web that the LM317 regulator used in the brmlab.cz design may not be “stable” at low current levels. Some have suggested that the LM334 is a better, safer, regulator choice. The “GoFlow” design uses the LM334. UPDATE: I have updated my tDCS devices to use the LM334 design. See one of my later posts or http://www.flowstateengaded.com for examples. 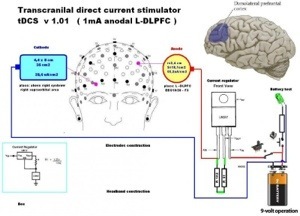 Before attempting to build your own tDCS device, please read, read, read, about tDCS and look at my web site and others for safety precautions. I bought mine on EBay. You can get several for $10 including shipping. Very nice design. Is there a step-by-step guide anywhere that would show how to build a device like this, for someone with no experience in building electronics? 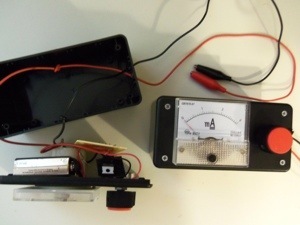 I would really like to build a simple but elegant device like yours rather than spend $300 on an iontophoresis unit. I’m not aware of a step-by-step guide for building a tDCS device. Perhaps a friend or associate with electronics experience could help you? Will you sell one to me? Sorry, I don’t sell tDCS equipment. OK, this is what I get for not doing the minimal research before asking a question. Can you confirm that this is what you were doing, jumping terminals 2 and 1 to use it as a variable resistor input to the LM334? If you are referring to the schematic, it’s just the way the drawing tool made it look. Pin 1 goes to + on the battery, pin 2 to pin 2 on the pot, and pin 3 goes to the point where the 470 and 15 meet. Hope that helps. Ah, I was actually referring to the pot itself. Looking at the newer schematic on you site, I think it all makes sense. Pot terminals 1 and 2 get wired together (wired as a variable resistor), 2 goes to the LM334, and 3 goes to the 15 ohm resistor. The wiring for the LM334 itself seems fairly obvious. That leaves one last thing I want to verify before going off to build. I feel a silly asking this, but is the LED you have for verifying battery function going the wrong way in the schematic? And do you have a value for the LED’s resistor? It seems we don’t have Radio Shack in Japan so I’m trying to match your design as closely as possible without the pair. Yes – thank you for catching that. I have flipped the LED in the diagram. 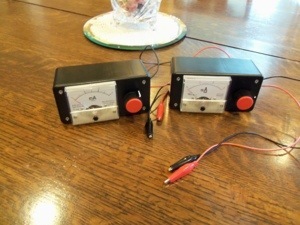 The RS device is a combination resistor and LED. Most designs I’ve seen use a 4k or 5k resistor in series with an LED. tDCS Units | SpeakWisdom <Loved it!